I answered a similar question: cmd-tab behavior on Mavericks with multiple displays. The action that summons the dock to the opposite monitor is not very intuitive for me. This is what worked for me. The target area of the cursor needs to be at the bottom area of the monitor which doesn't currently have the dock at a place where the cursor can't move further down, i.e. this doesn't work on vertically stacked monitors along the area where the cursor can cross between screens. Once the cursor is "blocked", pause a sec, then continue the motion downward. The dock will be "summoned" to this monitor from the other monitor. 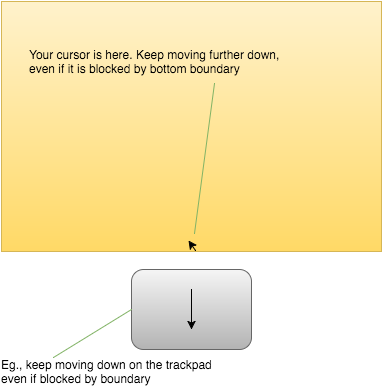 This works for vertically stacked monitors as long as there is some place where the cursor is "blocked". If not, the cursor will just move to the other monitor since it is not "blocked". If you have identical resolution monitors, this will probably not work per @Geraldus_US's comment below. In that case you probably need to either left dock or right dock per @Geraldus_US. Alternatively, unplug the auxiliary monitor and the dock will switch to the main monitor. I don't see how anyone would find these motions to be intuitive. How about a simple right-click option to "move Dock to this monitor"? Obviously, Apple didn't account for over/under monitor configurations. In this case, the switching is constant and annoying. I suppose that they assume you will put the dock on the side of the monitor, but I can't stand that config. I also found this 'feature' annoying as you expect the Dock to be on one screen then you accidentally move the mouse to the bottom of the second screen and the Dock moves across. The easiest way to get it back is to move the mouse to the bottom of the screen you want the dock on. Sometimes you have to move it up then back down to get it to move. At work I have my external monitor on a stand that sits behind my MacBook and arrange the screens so that the external monitor is just higher than my Macbook Screen then in the settings move the screen layout so they sit on top of each other. In this layout only one screen has a bottom as the external monitor is an extension to the Macbook Screen, thus stopping the Dock from moving. This layout also saves on desk space if you have a narrow desk. At home I use a monitor side by side but set the dock to auto hide, then when I need to get to the Dock I just scroll down to the bottom of whatever screen my mouse is on to get the Dock. Because the Dock is always hidden and comes on when I want it I don't seem to find it annoying like I do when it is fixed at the bottom of one screen. Not the answer you're looking for? Browse other questions tagged macbook mavericks display dock . Dock randomly switches between screens. Any way to stop?